Walrus Audio Bellwether Review – Best Analog Delay Pedal? Do you remember Winter NAMM 2015? That was the year Walrus Audio laid down the gauntlet with prototypes of 3 flagship pedals: the Vanguard Dual Phaser, Luminary octave pedal (a release I’m still waiting for), and the Bellwether analog delay pedal, not to mention their game-changing Phoenix power supply. Basically, Walrus Audio have been bringing it in a big way with each of their releases aiming to set a high bar of excellence in their genre of effect. (See the Janus fuzz/tremolo and Descent reverb pedals for a couple proven examples.) The Bellwether hopes to set a new standard among analog delay pedals. Let’s see if it’s the beacon of change needed for your pedalboard. Housed in a similar-sized enclosure to the Walrus Audio Descent, the Bellwether sports similarly eye-catching artwork along with a familiar arrangement of knobs, jacks, and foot-switches. All the functions are laid out in an easy to understand arrangement, and the distance between the foot-switches provides plenty of room for activating the pedal and using the tap tempo function. The analog delay pedal arena has become quite competitive in recent years, with many builders vying to check all the boxes in terms of cramming every possible feature conceivable into a pedal. Walrus Audio hit the most important marks with Tap Tempo, 4 of the more commonly used tap divisions, optional modulation with Rate & Depth control, and a Tone knob, an essential feature to defining the sound of your analog delays (more on that later). In the I/O and connectivity department, you’ll rarely see an analog delay with dual outputs, a welcome addition if you want to send the Bellwether’s signal to multiple destinations. The EXP output is handy for controlling Time and Repeats, although an additional Level exp option would have been nice for some players. The FX Loop is another handy feature that sound explorers will enjoy as this lets you apply other effects to your delay signal. The Tap In lets you use an external remote switch for controlling tap tempo, useful if you’re using the Bellwether remotely from an effects switcher or loop and still want the Tap Tempo function close by. One important note to mention. If you get the urge to open the pedal, you’ll see its meticulously laid out PCB in all its glory. You’ll also see a ton of trimmer pots. Do not adjust these! The Bellwether has been carefully calibrated from the factory, and these aren’t meant for end user adjustment. Look in awe; then close it up and never be tempted to fiddle around with these. The Bellwether covers the essentials and then some. Next, we’ll talk about how it sounds. 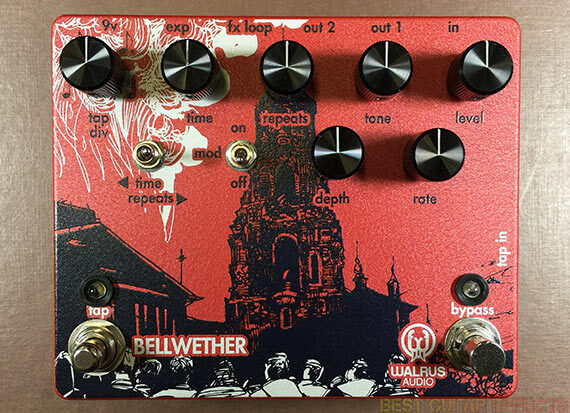 Visit Walrus Audio for more info about the Bellwether. In action the Bellwether is pretty straightforward to use. The two things to immediately be aware of are the Repeats and Level settings. Mind your Repeats as the Bellwether will self-oscillate with runaway trails when this knob is set upwards of around 2-3 o’clock and higher. The Level knob sets your overall delay level. Dial it upwards a little past 3 o’clock to find a level that matches your dry output signal. The sounds are as great as you’d expect from a quality analog delay. 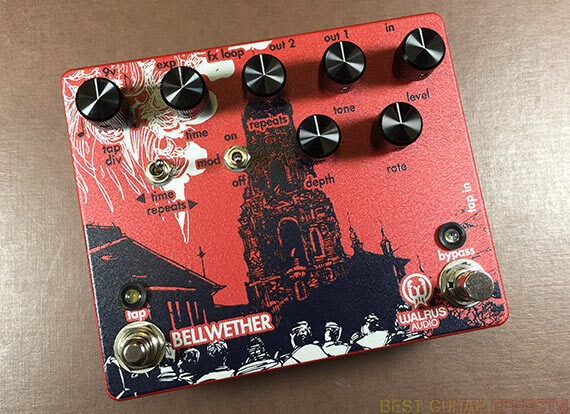 The Bellwether also has a reasonably low noise level considering its analog nature. But the real draw of the Bellwether’s sound comes from the Tone knob. The classic bucket brigade delays of old are usually known for their distinct tonality and consistently darkening repeats. The Tone knob on this pedal allows you to cover a range of brighter to darker analog delay tones by rolling off the highs as you set the knob further clockwise. Another key component of this pedal is the Mod section which sounds particularly good. Familiar Depth & Rate knobs dial in the intensity of the effect. It can get pretty extreme at high settings, but simply applying a light amount of both parameters for some subtle movement works wonders. It’s hard for me to force myself to turn it off. It also works with the FX Loop so you can add modulation with any other effects pedals you’re using in the loop. The Time knob can give you a quick slap back style reflection or take you on cascading expeditions with delays up to 1000ms. Rolling it all the way down with a higher Repeats setting will give you a psuedo-reverb like decay. The greater fun is in using the Tap Tempo with a selected Tap Division to quickly get your delays in time with the music. Straight quarter and eighth notes keep it simple, great for lead work with overdrive or distortion. Triplets are handy for the obvious triplet feel, a division often overlooked on some analog delays with tap tempo. The dotted eighth setting is a favorite of many guitarists seeking rhythmic delays, and it really shines when playing intricate chordal phrases or single note arpeggios. Plugging in an expression pedal adds even more creative control. You can smoothly modulate the Time between settings or rock the pedal rapidly to warp the pitch of the delayed signal. Lots of psychedelic sounds to be heard. When the switch is set to modulate the Repeats, you can more easily control the oscillating delays. I find it fun to hit a chord and crank the repeats, then pull it back before hitting another chord to delay it and swell the repeats again. You can add some mesmerizing atmosphere to your music this way. While the Bellwether’s delay sound is already great as is, the FX Loop is not to be overlooked as you can use your other guitar pedals to color and modulate the repeats. Try adding a flanger or even a reverb on just the repeats. You could also apply an overdrive pedal for some grittier repeats or for a cleaner boost to increase the volume of your echoes. Walrus Audio has plenty of tools for the job. I also had fun mixing things up with an Electro Harmonix Superego and Dr. Scientist The Elements in the FX Loop. What’s great is no matter what you run through the FX Loop, you can still use the pedal’s Tone knob and Mod section on your repeats as well. Lots of fun can be had with this. I spent most of my time testing the Bellwether in my amp’s effects loop. Here it sounds great. This lets the pedal delay what’s coming from your amp’s preamp which sounds great when the amp is overdriven or heavily saturated. I also tried it with Out 1 & Out 2 in front of 2 similarly voiced guitar amplifiers. While the Bellwether sounds great in front of one or two amps, I was expecting the dry signal to be sent to one side and the delay signal to the other. This isn’t the case as each output sends the same signal. So this isn’t a stereo delay as you might imagine but a way to send your signal to 2 destinations if needed. If possible I’d recommend just using Out 1 and placing it in an effects loop after modulation but before reverb as a proven method of getting good results. This brings up an interesting point. While a single jack TRS effects loop has been seen a few times before on analog delay pedals, the extra non-true-stereo Out 2 jack might have been more useful as a dedicated FX Send. The FX Loop jack could then have been the FX Return. Since most analog delays are used in mono anyway, having dedicated FX Send & FX Return jacks could encourage more guitarists to experiment with the FX Loop without the need for a specialized TRS cable. You’d just use a couple extra patch leads. Just a thought in case Walrus Audio ever considers any minor hardware revisions. I only have a few quips with the Bellwether. Most of the Level knob’s range is pretty quiet, meaning you won’t really notice much of the delay signal until you get the knob up past noon. This gives you somewhat limited knob range to really dial in the perfect amount of delay. I’d actually like to see this refined in a hardware revision if it hasn’t already been addressed. Some guitarists might have wished for a 3rd foot-switch to activate/bypass the FX Loop (which would be especially useful with the FX Send & FX Return idea I mentioned before, putting greater emphasis on coloring the Bellwether’s delays with other pedals). A 3rd foot-switch might have compromised the spacious comfort of the 2 foot-switch layout. Still if there were 3 foot-switches, that might add a little ease of use with the FX Loop instead of having to manually disengage one or more pedals in the FX Loop when you just want the standard delay sound. I’d still be curious to see a 3rd Exp Pedal option for Level, but none of these concerns are deal-breakers. The Bellwether is a great-sounding analog delay pedal that deserves an audition. 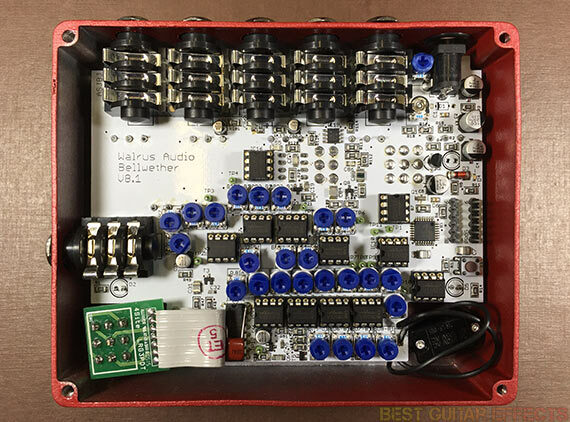 The Walrus Audio Bellwether is one of the best upper tier analog delay pedals available today thanks to its great sound quality and deep feature set. It’s versatile and straightforward in use. The sound is warm and full of analog character with the Tone knob and Mod section adding distinctive personality to the repeats. I’d highly recommend trying the FX Loop as you can further create your own signature delay sound. The Bellwether will surely be finding a home on many pedalboards. That concludes our Walrus Audio Bellwether review. Thanks for reading. 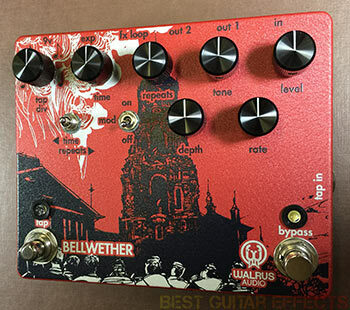 Want to buy the Walrus Audio Bellwether? Reminds me of the delay that Brian May used on The Prophet’s Song! That’s a stunning sounding delay. Shimmery, pretty, some wonderful depth. Love it! Wow! Amazing. I really liked the dotted eighth notes with palm muting. I certainly adds a very cool sound, and would fit in well with all styles of music!